I have a new favorite pattern. 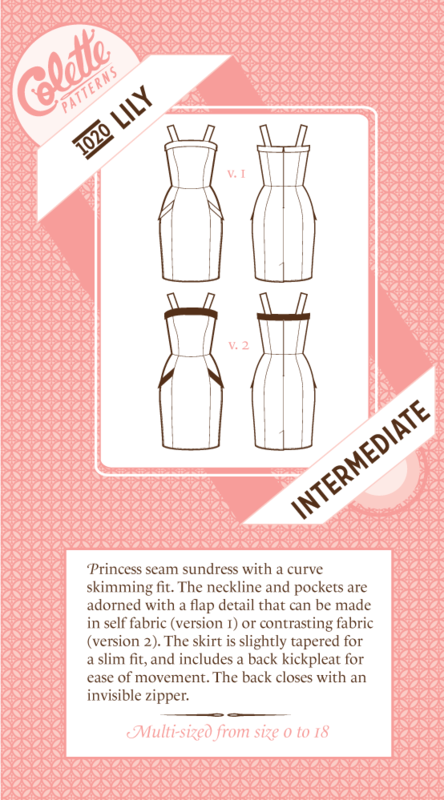 A new old pattern, as it was released more than two years ago. 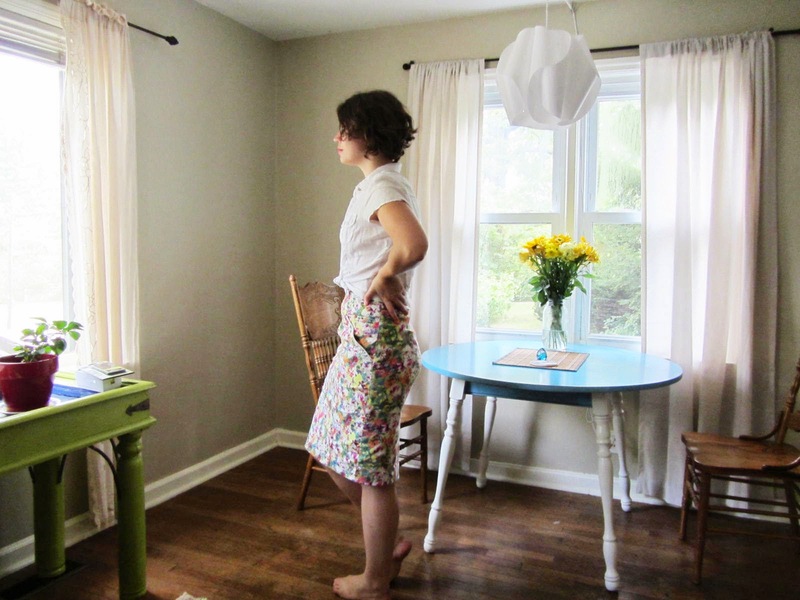 I know that’s really not so long, but in the sewing blogosphere I think we may have short attention spans. Ooh! Anna! – Ooh! Archer! – Ooh! scuba knit! – Ooh! Kimonos! I think it’s because we have a never-ending flow of inspiration and interesting new patterns and fabrics to try, which is hardly a bad thing. Anyway, I’m always a few years behind the trend, and I’m just now getting around to sewing up Colette Patterns Lily. Everyone else might be through with Lily already, but I felt like I was uncovering a gold mine when I made this up for the first time. I sewed only the bottom half, as you can see. I started a new job this summer and was in need of office attire. 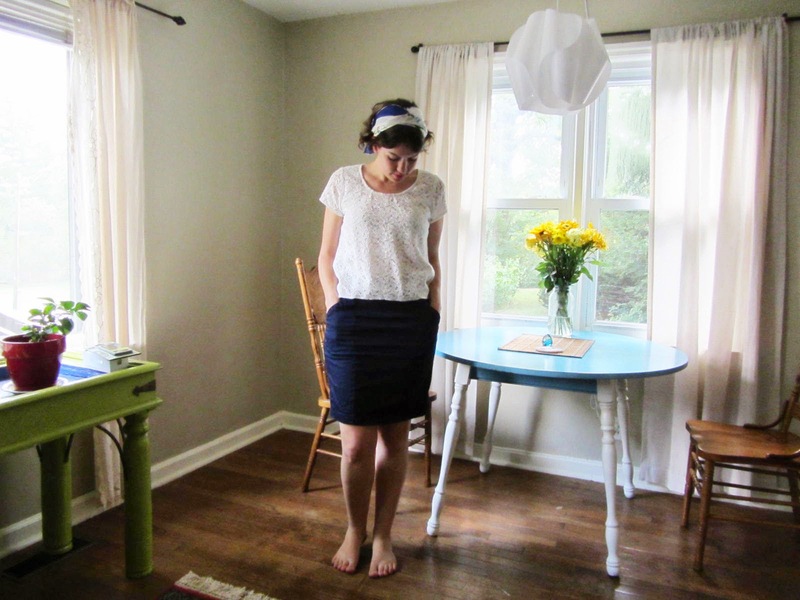 Rather than buy a pencil skirt pattern, I looked at Lily and thought it would do the trick. Did it work? I squeezed this baby out of 1.25 yards of fabric (I think) which required a little creative thinking. I ended up having to make the pockets just slightly smaller, but that’s no biggie. They’re still plenty big. And I love them. I didn’t make the pocket flaps, but used piping instead. 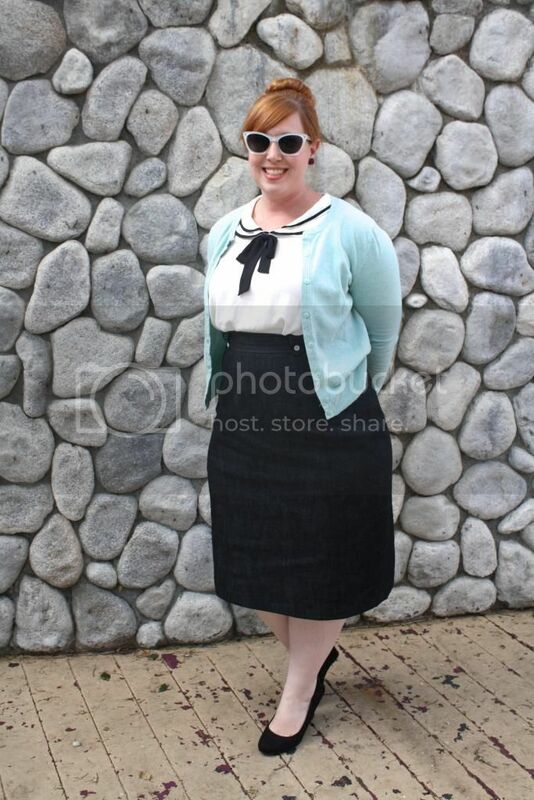 Also, I wore this skirt out somewhere and a man noticed and commented on my piping. Why thank you for noticing sir. I am impressed by your sewing vocabulary. Now actually, this is the second Lily I’ve made. Ready to see number one? I love it too. 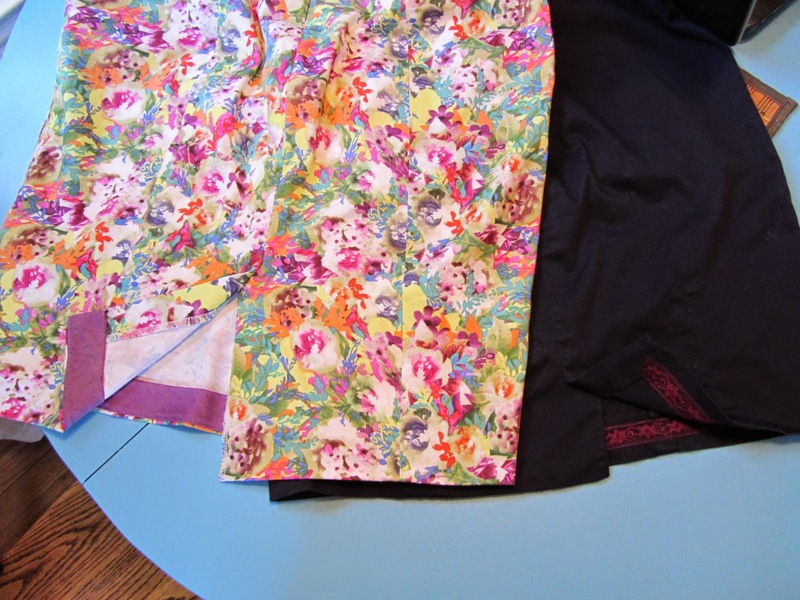 It is slightly more practical than my loud floral Lily, but it too is made of stretch sateen. You may notice that is slightly different from my floral version. For one, it is shorter. 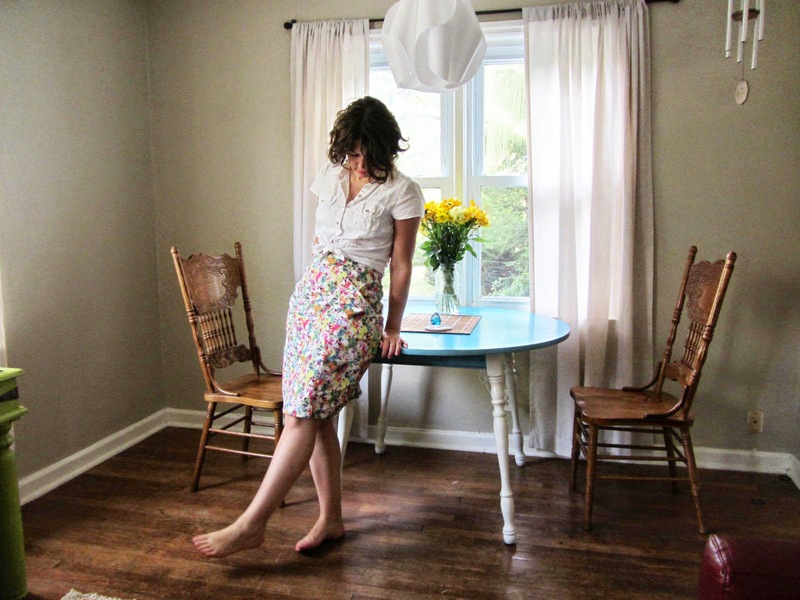 Another sewing blogger said she thought Lily is a tad short, and I agree. Not too short. In fact, it seems very accurately portrayed in both the line art and the model photos. And I like the length of my navy version. But too be prim and office-y I made my second version a tad longer. 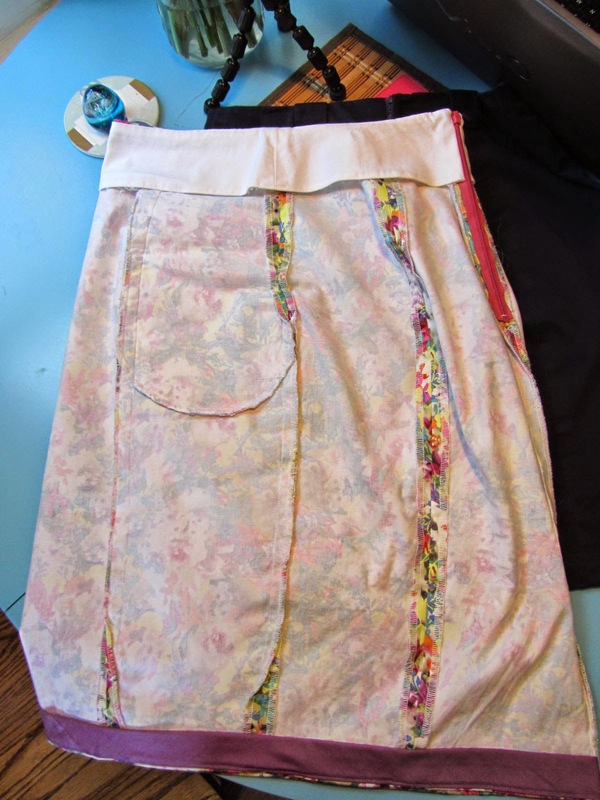 Also my floral version is a tad taller in the waist, because I wished it so for the second version. The original isn’t too low, I just wanted to have a high-waisted skirt. Still, it’s a dang good fit for what I only expected to be a wearable muslin. I apologize that it’s hard to see much detail on the navy. I swear this looks more wrinkly in photos than it does in person. Whatever. The wrinkles don’t bother me so much. I love both these skirts so much, and they are getting plenty of wear at my new job. The stretch woven makes them very comfortable, and I love the princess seams for giving an excellent fit. I like this pattern so much that I’m already working on my third version – this time with the top half. 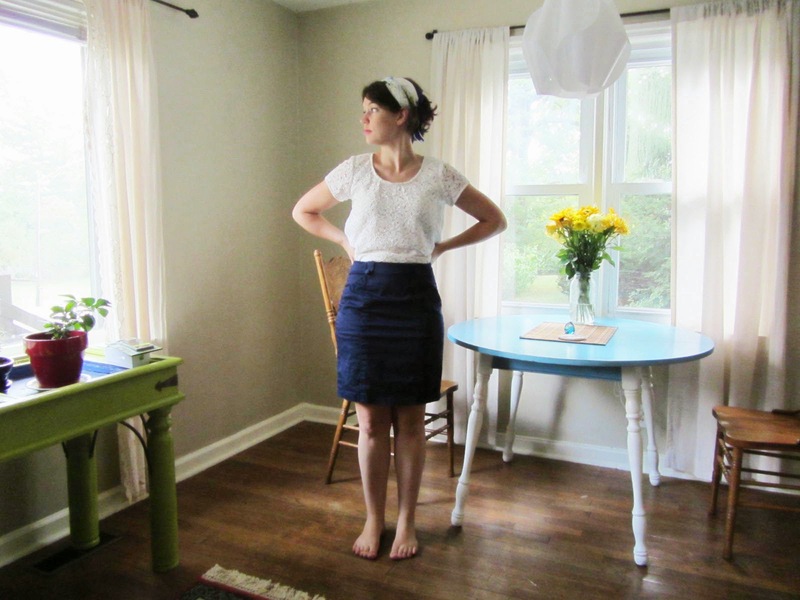 And I’d like to make a few more skirt versions as well… and maybe a version that’s just the top. With a peplum? With a knit? Seriously, I feel like this pattern has loads of potential, just waiting to explode all over the place. Nice job Colette Patterns. See how the vent on the navy version seems a bit puny? I made it longer in the floral version, and I like it better. It’s a small thing, but there ya have it. It’s hardly going to keep me from enjoying the skirt though. The second issue is not the pattern’s fault really. As much as I love the princess seams for giving a nice fit, they are a pain in the tuckus for ironing these things. I don’t know if it’s the fabric’s fault or what, but the seams I pressed open don’t want to stay open, and all those seams make for some tricksy ironing. Oh well. Again, it’s not going to keep me from wearing them. But I would love to make a version with flat felled seems, which I think would solve the problem nicely. I could also just serge the seam allowances together instead of serging the two sides separately, which might also help. But I thought it’d be nice to be able to let the seams in or out over time, so I did it the hard way. Live and learn. Coming soon – yet another Lily (and perhaps another), and more swimsuit bottoms! A lily pencil skirt? Super awesome! 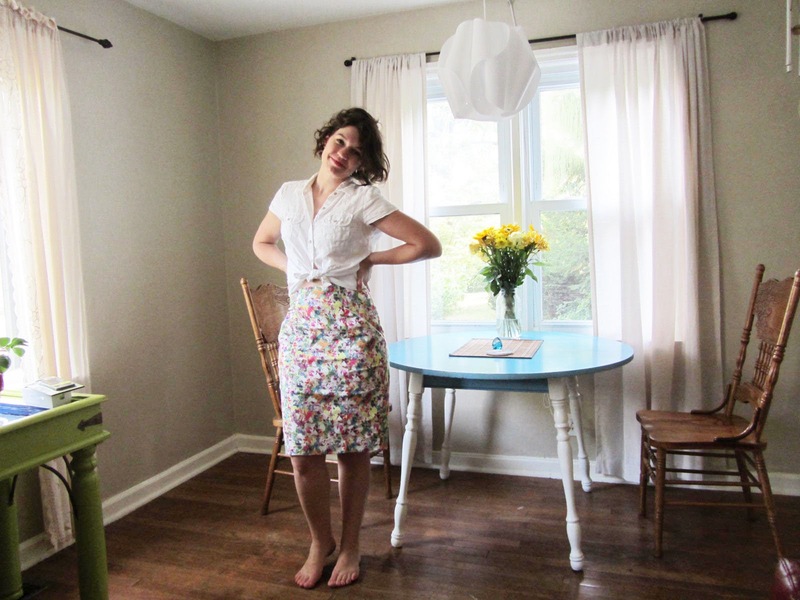 I just love your floral fabric and the piping! Oh, what a novel idea. I never even did think about making just the skirt portion instead of the dress. I do love that floral fabric too. And yea! what's up with that mini kick vent – hardly seems worth it being that small. Your floral one looks so much better. Thanks! The fabric is from Joann's and actually seems to be pretty decent quality, but I'd love to give this pattern a go with some nice wool for winter. Finish taping that bad boy together! It's so easy to fit and so satisfying to sew! Maybe the tiny vent is to increase the wiggle in your walk? Ha! It's an easy enough fix, at least.